The Lambspun Award for "The Tree of Royalty." "Fiber Celebration 2000," Northern Colorado Weavers' Guild, The Art Center, Estes Park, Colorado, May-June 2000. Jurors Award for Best of Show for "The Tree of Merriment." "Craft Forms '99," Wayne Art Center, Wayne, Pennsylvania, December 1999. Juror's Award of Merit for "The Midsummer Night." "Myths: New Form, New Function," Arrowmont School of Arts & Crafts, Gatlinburg, Tennessee, February-May 1994. Honorable Mention for "Gene-Illogical Tree." "The Wichita National," Wichita Center for the Art, Wichita, Kansas, August-September 1993. One of Ten Best Art of Show: "Beyond the Frame." "Materials Hard & Soft," Visual Arts Center, Denton, Texas, September-October 1991. Juror's Award, Best Fiber Art of Show: "Screen 1." "Currents '89," Middle Tennessee State University, Murfreesboro, Tennessee, March, 1989. Award of Excellence: "Grandmother Pilar." 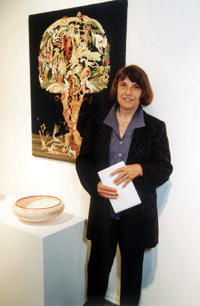 Luckenbach Mill Gallery, Juried Exhibition of Contemporary Crafts, Bethlehem, Pennsylvania, October-November 1986. Multi-Media Exhibition, Guilford Handcrafts, Inc., Guilford, Connecticut, October 1986. 1984 Diana Grossman Award (for Best of Show): "Penelope." Eleventh Biennial Exhibition of the Embroiderers' Guild of America, Museum of Art, Indianapolis, Indiana, October-November 1984.